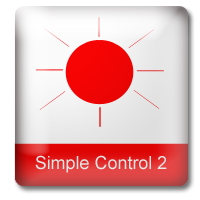 Simple Control is a tutorial used by hundreds of schools to introduce control. Simple Controls’ programs centre around a simulated electronic control box, which is similar in operation and style to conventional control boxes used in schools. This simulated control box enables the pupil to learn about control without the practical problems associated with an actual control box. 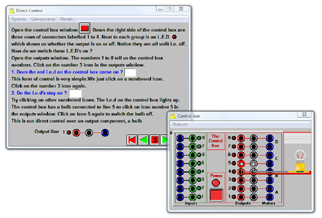 Direct Control - Point and click control with inputs, outputs and control box windows. Computer Control - is unique in that it combines a tutorial in which there are embedded code boxes for pupils to type in commands (these are all prefixed commands). They can see the result of these commands immediately in the simulated control box window. Buggy - A tutorial which introduces pre-scripted programs for controlling a simulated buggy. Control Simulations - Several examples of simulated control systems, including traffic lights, alarm etc.